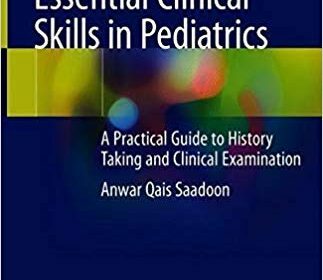 This book is a concise learning guide dedicated to the full scope of pediatric history-taking and clinical examination, for use in OSCEs as well as clinical life. It guides the reader simply and methodically through what to ask when taking a history, and how to perform a comprehensive physical examination. The book contains more than 30 “History Stations” covering the most common pediatric cases, as well as 10 “Examination Stations” covering examinations of the different body system. It provides students and resident doctors worldwide with the necessary core information for pediatric history-taking and clinical examination, all in a brief and interesting format. The book adopts a reader-friendly format through a lecture-note style and the use of Key Points, Clinical Tips, Notes, Tables, and Boxes listing the most important features. It is also richly illustrated, demonstrating the correct way to perform clinical examinations. Written “by a resident, for residents and medical students,” this book has been revised, foreworded, and peer-reviewed by fourteen prominent authorities in the field of Pediatrics from various parts of the world (including the United States, United Kingdom, Australia, Italy, Canada, and India), and from different universities (Illinois, Pennsylvania, Washington, Oxford, Edinburgh, Keele, Melbourne, Toronto, Parma, and Florence Universities). These experts recommend this book for medical students, pediatric residents, and pediatric practitioners, as well as pediatricians.